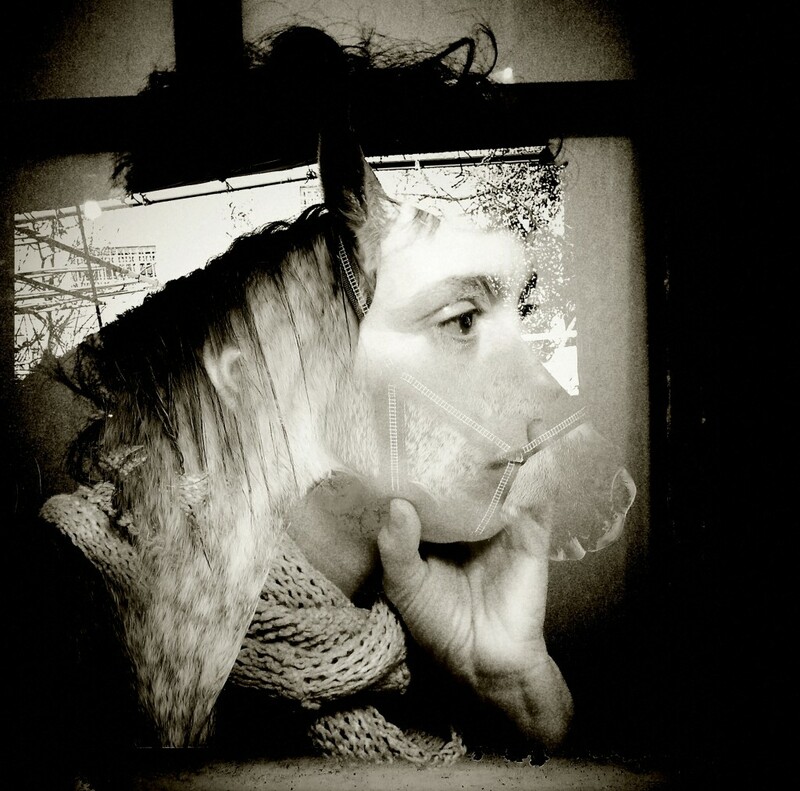 Call for entries for the AOP Student photography competition opens on 23rd January and closes at 5pm on 7th April. There are three categories: People, Places and Things. The Awards are open to all students studying a recognised photography course and provide a perfect springboard into the world of professional photography. Judges are Rachell Smith for People, Howard Kingsnorth for Places and Karl Taylor for Things. Winners will be announced at the Awards presentation at Downstairs at Mother on 6 July 2017. Aside from recognition and kudos, winners receive prizes, have their winning image exhibited at the AOP Student Awards, the AOP Photography Awards in October, feature in the AOP Photography Awards Book, travel to the Retina Photography Festival in Edinburgh and The Photography Show in Birmingham over the following year. As part of the Student Awards, there is the AOP Affiliated Course of the Year award and AOP Affiliated Course Lecturer of the Year awards. The Association of Photographers is the UK’s leading organisation representing professional photographers working in the creative industries. Formed almost 50 years ago, our 1,850 members include professional photographers, photographic assistants, students, affiliated courses, affiliated businesses, photography agents and those working in the image-making industry. For more information please contact Charlotte Giles on charlottegiles@aophoto.co.uk , visit www.the-aop.org or ring the office on 020 7739 6669. 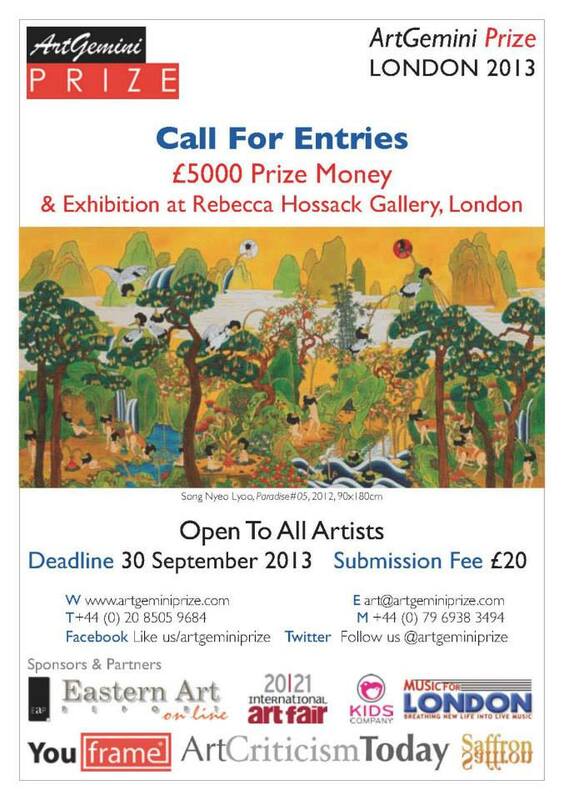 Call For Entries opens 15 May – 07 Sep 2014, artists and photographers are invited to enter online www.artgeminiprize.com for the opportunity to win one of 4 categories from the £5500 Prize Fund. This year is being opened to sculptors as well, plus there is a young art prize sponsored by Jacksons Art Supplies. Importantly shortlisted entrants are also exhibited in London plus they have an exhibition opportunity in Singapore. 2014 Judging Panel is made up of five judges including: Dr Phil Shaw – Doctorate in Printmaking and renowned artist to the 2013 G8 Summit; Viv Lawes – Senior UK art consultant to One East Asia, lecturer and writer; Zoe Whishaw – Commercial photography consultant, mentor and previously European Director of Photography at Getty Images; Sajid Rizvi – Chair, ArtGemini Prize Selection Committee and Judges’ Panel, Founder & Publisher of EAP Group International Media. International Art Gemini Prize : Deadline extended to 12 October 2013 in order to support so many artists who had asked for an extension – prize fund of £5,000 plus chance to have your work exhibited in leading London Gallery, Rebecca Hossack Gallery. 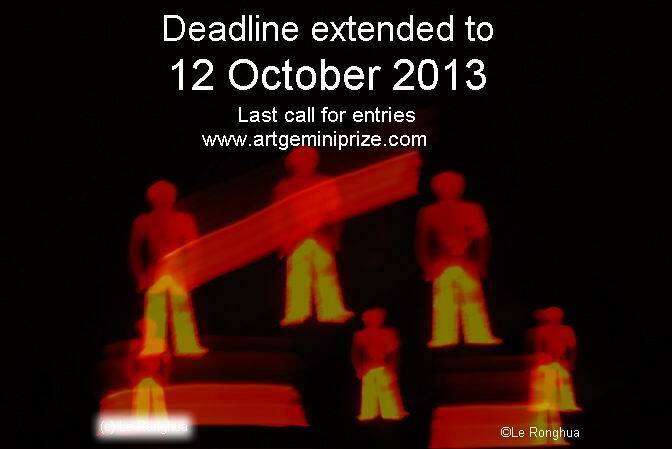 Photographers and Artists have just four weeks to enter the Inaugural Art Gemini Prize, deadline 30 September 2013. The ArtGemini Prize is a celebration to promote international contemporary art for emerging and established artists around the world. It is an independent competition, open to all artists from anywhere in the world. There is no age limit. One of the main benefits is that shortlisted applicants will be exhibited in London at the Rebecca Hossack Gallery. 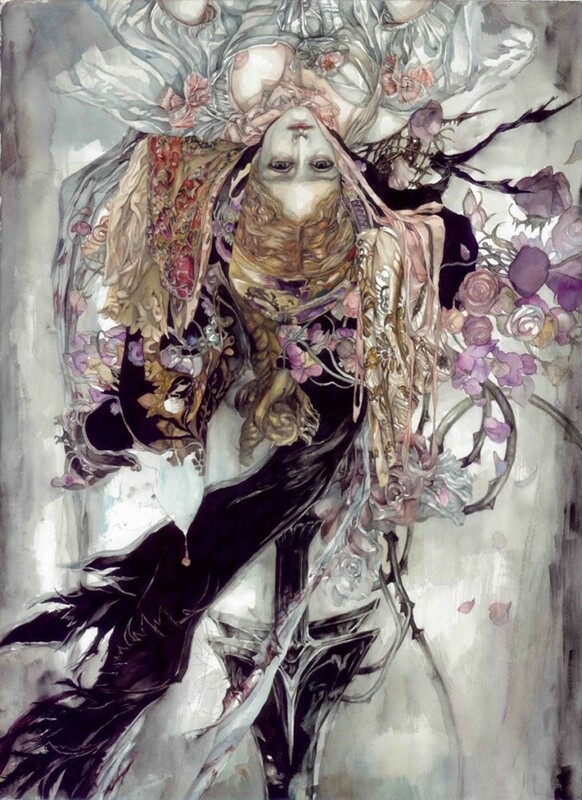 The winners will be announced at this exhibition of the finalists’ works. Latest international entries have come from Belgium, Latvia, Lithuania, Poland, Mexico, Spain and Switzerland. In addition, artists will be supporting the charity Kids Company in London, which helps give opportunities to many of our capital’s underprivileged young and helps them through fragile formative stages of their lives. “Our ambition is humble enough: if we succeed in bringing to international audiences even ONE artist of exceptional talent, we’ll have reason to conclude that we have achieved something. Of course, we want to do better than that, and strive to spread the benefit of our being here in this dynamic, ever changing, ever exciting space for creativity and its tangible result in new art.” Sajid Rizvi, Chair Art Gemini Prize.